TONIGHT I See Every Demonic Mask Coming Off! CLICK HERE TO WATCH NOW !!!! As the Miracle Pool draws closer within the next few hours, I want to share with you something very powerful. This month we are stretching our faith to the limit; what I’ve seen for the last few days since we opened up the miracle pool has proven that miracles are available for those who dare to believe. Though miracles may seem impossible…they do exist. Somebody was asking me, “Man of God why do you need to open up the miracle pool? What is the miracle pool for? Do you think that God will respond?” Child of God, I have seen a lot of things in my life and one thing I know is that God is not a respecter of persons but a respecter of faith. What I have seen God do in the last two weeks, what I have experienced and the testimonies I have heard shows that all things are possible to those that believe. For the last two weeks I’ve seen the blind eyes open, sick people being healed, debt cancellation miracles, financial miracles and extraordinary favours upon ordinary people, but the most amazing thing happening is the restoration of families, health and indescribable happiness that has come upon all that have been participating into this phenomenal event. In spite of all these miracles, what amazes me is that it’s not only happening to those who were there physically but those who though they are far away but by faith, they have sent in their photographs, CVs/resumes, bank statements, prayer requests, business cards, etc. as the Spirit of God led them. All miracles are the same. Surely, there has been no distance in prayer. And as a result of it, God keeps giving me new revelations. Last weekend God reminded me about an army general who was a great achiever but he had leprosy. His name was Naaman. Despite all his greatness, shame and disgrace followed him. But after the word of prophecy that he should dip himself 7 times by prophet Elisha, he was completely restored (2 Kings 5). 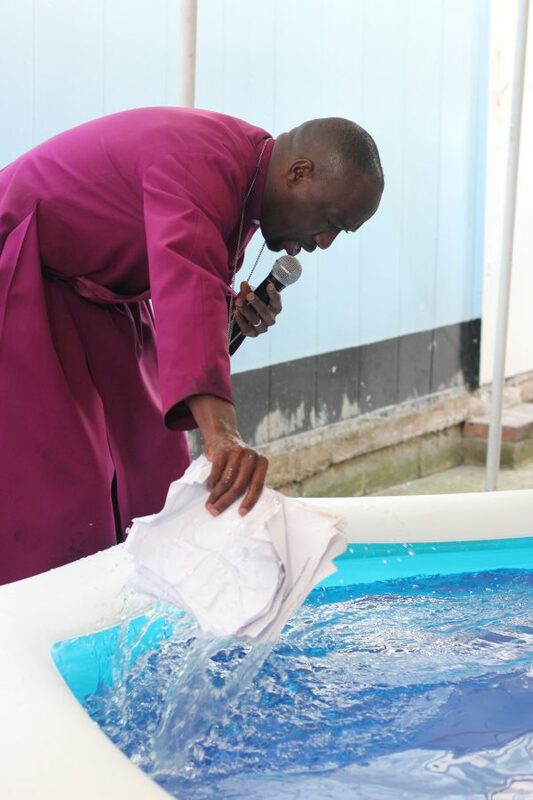 I believed the same and as I prepared the miracle pool, people were dipping themselves as the Spirit of God led and the same testimonies appeared too. Even those from far they were experiencing the same miracles, there was restoration everywhere. There are many things in your life that maybe you have blamed yourself for or others are blaming you, things that have blocked your destiny, blocked your life, but this Friday as I set up the miracle pool once again I believe with all my heart that as you wash your face in this miracle pool, God will open up your eyes, God will open up new opportunities, God will open up new doors in your finances, family, relationships, etc. But we must do something now. Now is not the time for the blame game, now it’s the time for faith. It doesn’t matter where your problem came from; this is the month of grace. I want to come in agreement with you according to Matthew 18:19 that whatsoever has blocked you, blinded you, hindered you, caused you to stagnate, to be delayed and to be disappointed must be unblocked. This is what I need you to do. Right now we must put our faith into action. I want you to send me the picture of your face; it could be the face of your loved ones, it could even be a picture of the face of your business, bank statements, debts, etc. As I dip them in the miracle pool, may the same God that opened up the eyes of a blind man and gave him the new opportunity do the same for you. You must act in faith quickly. Right now I want you to submit your prayer request by clicking the button below. But also I feel in my spirit, I want to challenge you to sow a special seed according to your age that whatsoever has blocked you must be unblocked (or whatever you can afford). You must build God an altar for open doors, open opportunities and open miracles. Reminder: We are having two Miracle Pools this weekend this Friday and Sunday. Due to a large number of requests being sent in, I must receive your prayer request within the next 24 hours so that I can be able to process it. THE NEXT MIRACLE POOL OPENS IN !!! Tonight Friday 19th May for our After Sunset Miracle Healing Service! Do you want to experience Healing, Deliverance and Breakthrough..? Then join us for MAY Month of MIRACLES! The month of the Impossible!